Maat was perhaps the least mythological of the Egyptian gods because she was the visual form given to a philosophical concept. Her physical form was a woman carrying the ankh and scepter, and she was most readily identified by the feather she wore on her head. No one knows for sure the origin of her association with the feather, usually described as an ostrich feather, but somehow the ethereal qualities of the feather seem well suited to a goddess of her characteristics. It has been suggested that the feather became her symbol because it is equally balanced along each side of the quill, suggesting the fine judgment required of a goddess who sat to judge truth in the trial of the dead. 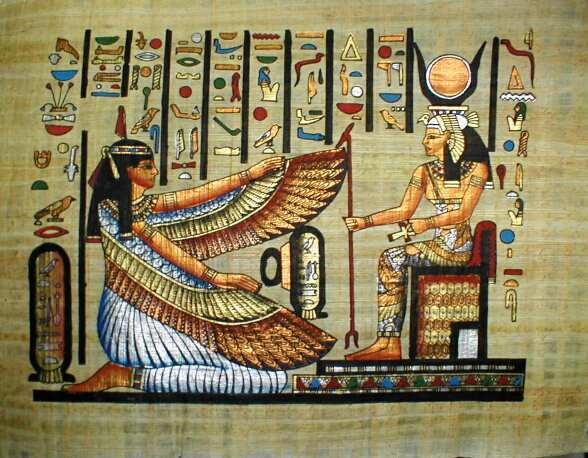 The philosophical quality that the goddess represented was also known as Maat and our loose translation is “truth,” but no single word will suffice to explain all that was indicated by the concept. Maat was the key to the Egyptian view of ethical behavior for humans while alive and of divine behavior in the judging of souls after death. As Siegfried Morenz has further explained: “Maat is right order in nature and society, as established by the act of creation, and hence means, according to the context, what is right, what is correct, law, order, justice, and truth. Maat was a guide to the correct attitude one should take to others. In its simplest form, Maat was represented as an early hieroglyphic made up of intersecting straight lines, which stood for the king’s throne, suggesting that his decisions rested on Maat. The name probably translated originally as “that which is straight.” The nineteenth-century American romantic Ralph Waldo Emerson wrote in his essay “Nature” that one of the uses of nature is to provide metaphors for moral behavior. This is just what seems to have happened with Maat. Straightness, which is a physical, geometric term, was perceived as symbolic of moral rectitude and then made visible in the hieroglyphic symbol used to indicate the concept. Straightness implies order, and the presence of Maat stamped order on chaos at the moment of creation. It was to embody this concept that the goddess Maat was conceived. She was the personification of truth and justice, but she was given only minimal human characteristics. She was more o^ a metaphor for this important quality than a “flesh and blood figure, as most other gods were. Her mythology says that she was supposed to have been the daughter of Ra and to have risen with him from the primeval waters at the moment of creation. have passed the first test and to be nearing immortality. Then the deceased progressed to the Hall of Maat, or the Hall of Judgment in which he or she had to give forty-two denials of sin and identify the magical names of the various parts of the door. Maat supervised these activities and, if the deceased completed these tasks correctly, she certified that the soul was ready for admittance into the presence of Osiris for final acceptance.